Trade and barter for unique items. Swipp is a savvy fae who has a watchful eye out for the next big trend. 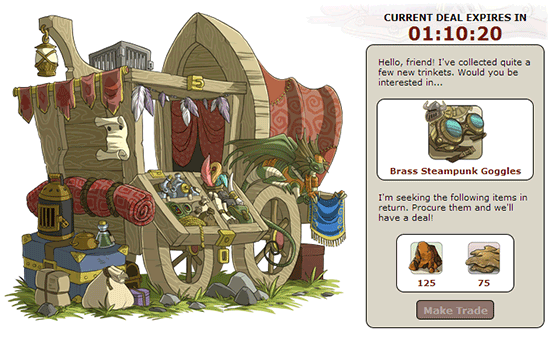 A player may visit Swipp every two hours to see the items he is willing to trade. Many of his deals are trades to turn less valuable items into more valuable items, (such as trading copper for silver), while others are unique familiars and apparel only obtainable through trading with Swipp. When visiting Swipp's Swap Stand, the item he will trade to you is displayed on the top right. The materials he wishes to receive will be displayed underneath. If you have the items he requires in the needed quantity available in your hoard, you will be able to make the trade. The traded item will appear in your hoard. Swipp's deals are a limited time offer; if you see an item you wish to trade for, you must do so within the time limit or be left to wait until the deal comes around again. A list of the items Swipp may offer. Note that he will randomly choose one of these offers every two hours. Gold items are offered exclusively through the swap stand.